What many people don’t realize is that this is not an unforeseen crisis. Believe it or not, 22 years ago, Congress wisely planned ahead just in case something like this happened in the future. Congress gave the president a valuable tool in the event that an “imminent mass influx of aliens” arrived at a coastal or land border of the United States. It was part of the Illegal Immigration Reform and Immigrant Responsibility Act of 1996 (IIRIRA), passed by a Republican Congress and signed by President Clinton. Codified in federal law at 8 U.S.C. § 1103(a)(10), the provision empowers the Secretary of Homeland Security to deal with a mass influx of aliens by authorizing state and local law enforcement officers to “exercise any of the powers, privileges, or duties” of ICE officers or Border Patrol officers. In other words, hundreds of police officers can be mobilized rapidly to assist the border patrol in performing its duties. It’s an instant force multiplier to protect our nation’s borders. The time has come to put this tool to use. 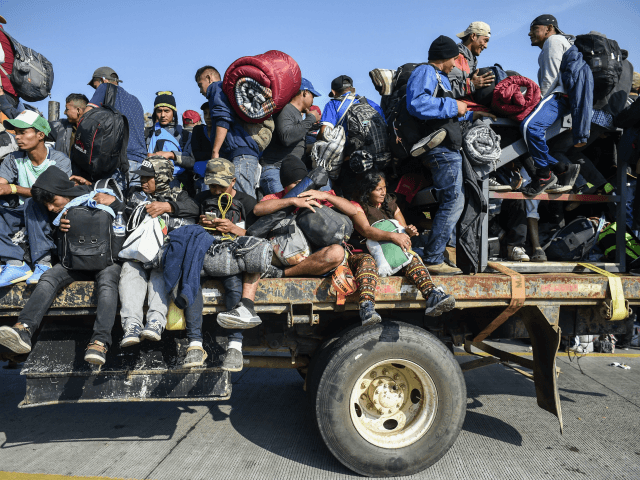 As the caravan members become frustrated with delays in obtaining asylum hearings and realize that, in any event, their chances of gaining asylum are miniscule, many will attempt to cross the border illegally. The U.S. military forces on the border are helpful in installing additional fencing, performing reconnaissance, and providing a visual deterrent; but they can’t make immigration arrests. However, state and local police officers who are authorized under this law and provided appropriate training can. One might argue that the liberal police departments in southern California are unlikely to want to assist the Border Patrol. That may be true. But the federal statute permits any state and local police officers to be deployed in the event of a mass influx, not just the ones at the site of the aliens’ arrival. So if Texas Rangers want to help, they can. Same goes with sheriff’s deputies from Kansas, or from Maine, for that matter. Any state or local law enforcement agency that wants to assist in protecting our borders in the event of a mass influx of aliens can do so, provided they are authorized by the Secretary of Homeland Security and undertake the training the Secretary requires. One of the most common expressions we hear about immigration is that “our immigration laws are broken and need to be fixed.” That’s a cop out. In many respects, our immigration laws are perfectly fine; and they include useful tools to ensure that the law is fully enforced. But it takes knowledge of what is in those laws and the will to enforce them, if we are serious about restoring the rule of law in immigration.